BUY TICKETS NOW BEFORE IT'S TOO LATE - TICKETS ARE SELLING EXTREMELY FAST!!! See you & your friends there! Be sure to "Like" & "Share" above to help spread the word!! Includes everything with General Admission tickets, just at a great discount for buying 6 or more tickets together with friends! Includes everything with General Admission PLUS hour early entry at 8pm and butlered light food. Ticket sales ended at: 12/31/2018 at 10:00 PM $84.95 Ended 43! Includes everything with VIP Admission tickets, just at a great discount for buying 6 or more tickets together with friends! Includes everything with VIP Admission PLUS a reserved seat all night long with waitress service and a bottle of champagne for your table just before midnight! VERY LIMITED AVAILABILITY! Limited to groups of 4 or more only. Ticket sales ended at: 12/31/2018 at 10:00 PM $99.95 Ended 24! Purchase this ticket if you need to add on to an existing table. Includes everything listed with VIP Reserved Seating tickets. DO NOT purchase this for ticket for new tables - your order will be canceled. You are REQUIRED to enter the order # & purchaser name for the original table purchase at check out. 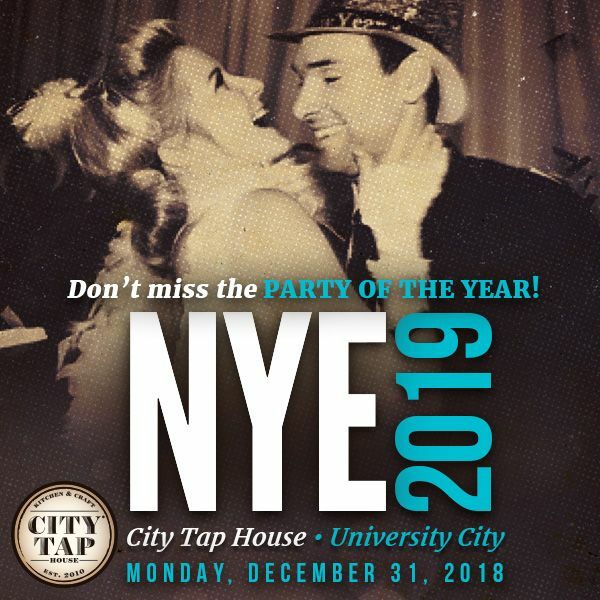 New Years Eve Philly 2019 at City Tap House University City in Philadelphia. Grab your friends to experience the very best in service, craft beer, food, party favors, and music while ringing in the new year right! Upgrades to VIP Reserved Seating are available (quantities very limited). JUST ADDED!! Don’t stop after the ball drops! Join Us at Zee Bar for the Official After Party with Complimentary Admission! Just show your party ticket (on phone or paper ticket) at the door after 1am to confirm your RSVP to this exclusive members only venue ($20 value)! Space is limited - entry not guaranteed once venue is at capacity, so get there early to beat the rush! City Tap House® University City offers craft brews on draft, cask, and by the bottle, from local breweries and our favorites from around the world. With our authentic, brick oven pizza and elevated, American pub fare, City Tap House® has truly updated the gastropub experience. View More Events Organized by City Tap House - University City. This event is organized by City Tap House - University City.